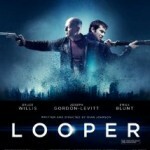 We saw Looper in the theatre and really enjoyed it. Not long after that we discovered that the director Rian Johnson (who also wrote the script along with help from friends) recorded a soundtrack intended to be listened to in the theatre. He is very specific to say that you shouldn’t listen to this commentary the first time you watch the film, and I’d agree as it would otherwise ruin a good story and a well-made film. But we were intrigued enough to want to listen to the commentary as intended, while watching the film. We never made it to the theatre again, but we did watch it on iTunes tonight via our Apple TV (an awesome product that we get quite a bit of use from). The experience was really good. The film was good to see again, but more significantly we really enjoyed the background on what scenes were trimmed, which were cut entirely, and how the remaining scenes were made. Once again we were reminded that films aren’t made as a single piece of work but instead are crafted, refined, re-cut, re-shaped, and polished until it becomes “just right” – something deemed good enough to release. I’d recommend the same experience for anyone who is a fan of film-making. Despite my initial disappointment with Netflix in Canada, it is more appealing than I originally thought. I’m still frustrated by the lack of “big name” movies – even those that are quite a bit older e.g. 2001 or Close Encounters of the Third Kind. On the positive side, I have found a few good films that I’ve really enjoyed. The trick seems to be to “sneak up on them”. In other words, I never find movies by searching for movies I think I want to see – those are never available. Instead, I explore what movies are available, as linked to other movie suggestions. I haven’t found very many of the initial suggestions to be good enough to watch, but I believe that is a feature that gets better with time, so I’m willing to keep trying. I think we’ve decided to keep our subscription going. At $8 per month, the cost of getting this decision wrong for a few months is not very high. Maybe that is why it works – it only takes one or two movies a month to make it feasible. We’ve run out of episodes of Top Gear to watch though, so now we need to find that next unexpected gem to watch. More than ever before, I’m confident we’ll find it. 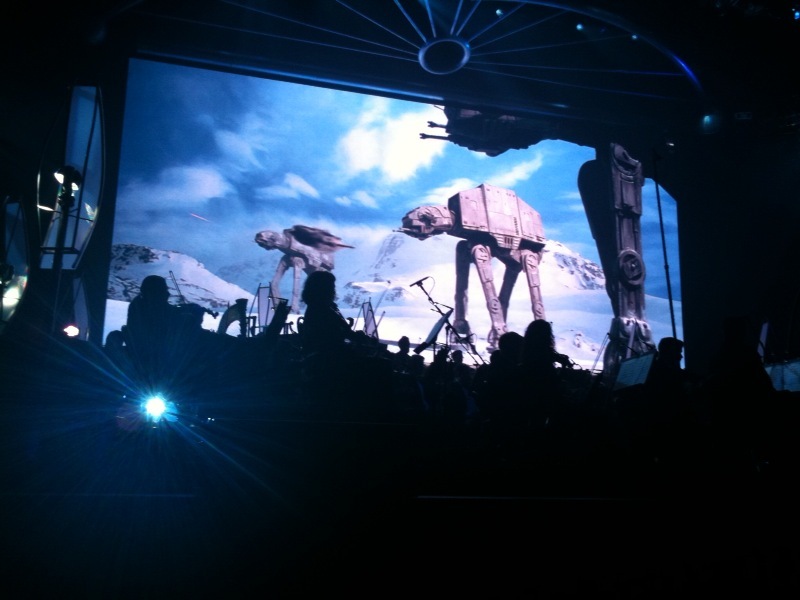 Last night we attended Star Wars in Concert here in Vancouver. It was most excellent! There were a few people dressed in costume (not me or Eileen though) and the general atmosphere was energetic, sort of like seeing the original movie in the theatre many, many years ago. I originally thought the event would be showing the entire first movie, but later learned it was a composite of many clips from all six films. I have no idea how it worked out so well but through the miracle of online ticket purchasing combined with some amazing luck we scored front row seats on the floor, right in front of the stage. If I’d wanted to, I could have jumped out of my seat and easily leapt on stage. I could have tackled C3PO (Anthony Daniels) if I’d wanted to. Fortunately I resisted this urge and therefore am not writing this from jail. The event itself was really great, the music was wonderful and we were close enough to watch the individual performances of each member of the orchestra. The only somewhat disappointing part of the evening was having to sit through so many clips from the most recent movies (episodes 1, 2, 3). It really is painful to watch the stilted dialogue and terrible acting. There were plenty of scenes from the “good” films too, especially lots from episode 4. 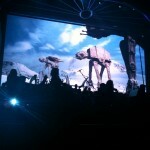 Of course the famous cantina scene played, with the live orchestra giving a great performance. Even though the film clip was from the 1997 redone version, we all knew Han shot first. Comments Off on Han shot first! Eileen and I finally saw the fourth installment of the Indiana Jones “trilogy plus one”. To say I was disappointed doesn’t come close to accurately capturing my mood as I left the theatre. Shock, dismay, and anger would be more appropriate. Really? 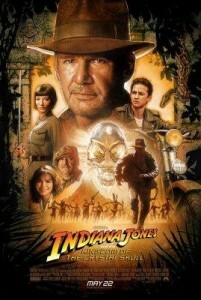 This is the best Indiana Jones film that can be made for $400 million dollars? I didn’t really have high hopes even before I went to the cinema, but nobody prepared me for this. But, alas, I should have known right from the beginning when I saw the story credits included George Lucas. Somebody should really tell him that his scripts are terrible. And he should listen up, and learn that CG of nuclear blast out in the desert, Communists chopping down the Amazon rain forests, aliens from somewhere other than Earth, and a big-name director are not suitable replacements for a well-written script. There was almost no redeeming value in this script, which I can only suggest is likely better to wrap up dead fish than to use in a high-talent action film. Had it not been for the nostalgia of the original Indiana Jones movies, I would say this is the worst movie I’ve seen in a very long time; The Scorpion King, maybe, is still leading by a little bit. The most recent Star Wars movies are certainly in the running as well (and guess who was also involved in those scripts!) I think I see a pattern… It makes me wonder who really wrote the original Star Wars script. In addition to George Lucas there is another name credited with the story. If I were Jeff Nathanson I would have asked to have my paycheck delivered to my house but my name dropped from the credits. David Koepp, the poor fellow credited with the screenplay, should have asked for similar treatment. Apparently the production went through eight writers, probably they just kept firing and hiring until they found someone who could tolerate working with the story as set out by Mr. Lucas. This film was so cliche, so predictable, and so sloppy that it is possible that even Steven Spielberg must look back and think to himself “oh crap how did I get roped into this one.” Fire ants the size of grapefruits? The character Mutt swinging from trees like Tarzan? Mutt is the son of Henry Jones? Area 51 aliens? Shudder. Even a great director can’t fix a terrible script. As you might have guessed, I won’t be picking up the Indiana Jones boxed DVD set for Christmas.